THIS LANDMARK PUBLIC TELEVISION SERIES provides a sweeping panorama of California art from statehood in 1850 to the onset of the Great Depression in 1930. Spanning the entire state and eight decades, the four-part series contains nearly 300 paintings by more than 70 artists. Some 30 historians, curators, and other observers provide insights into the artists and their changing interpretations of the physical and cultural landscape of California. The commentators include Alfred Harrison, Harvey Jones, Wanda Corn, Nancy Moure, Jean Stern, William Gerdts, Will South, Patricia Trenton, Martin Peterson, Bram Dijkstra, and Nancy Boas, among others. Several relatives of artists are also featured, including Mirelle Piazzoni Woods, Walter Judson, Roy Rose, Evelyn Payne Hatcher, Charlotte Braun White, Margaret Mitchell Sadler, and Libby Buff. Carefully crafted narration supported by an original musical score weaves the rich pictorial elements together to create an illuminating and enduring account of California in the late 19th and early 20th centuries. California�s artistic awakening in the American period began in the northern part of the state, especially in Yosemite and the Sierra Nevada Mountains, where artists found scenes of natural grandeur to rival the Alps in Europe. This program traces artists� changing responses to the landscape and culture of California, from mid-19th century celebrations of mountain majesty to the hushed, poetic images of the Tonalist painters to the colorful explosion of Impressionism in the early 20th century. It also observes the emergence of important art communities in San Francisco and Monterey. Featured artists include Albert Bierstadt, Thomas Hill, William Keith, Arthur Mathews, Xavier Martinez, Gottardo Piazzoni, E. Charlton Fortune, Armin Hansen, Childe Hassam, Paul Dougherty, and William Ritschel. Los Angeles developed an art community somewhat later than San Francisco, but it too attracted artists of national and international repute. The second program examines the growth of that community, with special attention to Impressionism as a major artistic force in the early 20th century. The factors favoring Impressionism in the Southland are highlighted. They include artists� fascination with the Southern California landscape, the intense light and hazy atmosphere of the region, the nature-oriented sensibility of the then-popular Arts and Crafts movement, and of course French and American Impressionism in their many variations. Featured artists include John Bond Francisco, William Lees Judson, Benjamin Brown, Hanson Puthuff, Sam Hyde Harris, Granville Redmond, Franz Bischoff, Guy Rose, Richard Miller, Lawton Parker, and Alson Clark. Venturing further south, this program looks at the development of important art communities in Laguna Beach and San Diego. It examines the spirited response of early artists to the distinctive qualities of light, color, atmosphere, and landscape in those areas, as well as their interest in Impressionistic modes of representation. 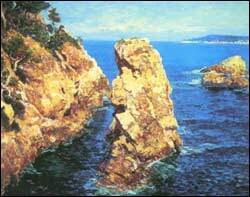 It also places California Impressionism in the context of American and French Impressionism. Featured artists include William Wendt, Anna Hills, Edgar Payne, Joseph Kleitsch, Charles Fries, Maurice Braun, Alfred Mitchell, and Charles Reiffel. The final program in the series examines the shifting attitudes and interests of progressive artists throughout California in the turbulent 1920s. Responding to Post-Impressionist currents in Europe and in the American East, these artists inquired into the nature of perception, questioned the physical and psychological processes involved in painting, and began to interpret the California landscape from a decidedly subjective point-of-view. Featured artists include Selden Gile, August Gay, William Clapp, Maurice Logan, Bernard von Eichman, Louis Siegriest, Anne Bremer, Helen Forbes, Maynard Dixon, Margaret Bruton, C.S. Price, Helena Dunlap, Henrietta Shore, Mable Alvarez, Jessie Arms Botke, Herbert and Meta Cressey, Donna Schuster, Edouard Vysekal, Clarence Hinkle, Thomas Hunt, and Conrad Buff. Impressions of California: Early Currents in Art was produced by Paul Bockhorst Productions for KOCE-TV (PBS, Orange County), with national satellite distribution via PMN. Richard Doyle is the narrator, and the original musical score was composed by Paul Morehouse. Funding for the series was provided by the Joan Irvine Smith and Athalie R. Clarke Foundation, Fieldstead and Company, The Fieldstone Foundation, The Argyros Foundation, and Friends of the Artists. Each of the documentaries in the series is approximately 28 minutes in length. All four programs are included on a single VHS videocassette. A DVD version is also available.